This is the road out of Stockholm. I'm looking out of the back of the coach heading South. This is my last photograph of Stockholm. I only spent a few hours in the city but saw so much. Sharing my tour with those who know the city well has been a joy. Visiting parts I never reached through the photos of others and re-visiting at different seasons those I passed through has enriched my memories of the place. I want to thank Per and his colleagues for inviting me here. Even if I never return here in the flesh I shall continue to make virtual visits for a long time. Although this is my last Stockholm photograph, I do have some extra ones of Nynäshamn tucked up my sleeve, which I shall share with you soon. It's been a privilege to follow you on our own ground Gerald! And it's amazing that you have posted 55 photos from your short stay here. Now lets see where this last photo is from. 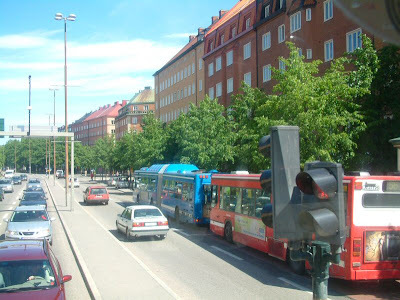 It's a red bus 55 and a blue bus so I would say you are on Ringvägen (yes, it could be with those houses) on your way to Skanstull where you will turn right to go south past Gullmarsplan.